Stock Instructions | Sholom - Care. Compassion. Community. 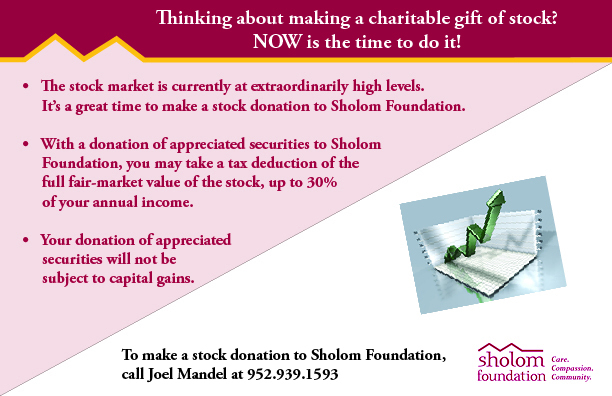 Please call the Sholom Foundation at 952-939-1593 to let us know the name of the stock and how many shares you are transferring so we can instruct our representatives at Fund Evaluation Group to watch for the stock. Have you or your broker complete the following form and fax the information on the form to: 513-977-4412. Click here to download the stock gift instructions form. For marketable securities over $5,000 you will need to report to the IRS. Please make sure your broker includes your name with the stock transfer. If you have any questions, please call Karl Lambert at 612-371-2886. The toll free number at the Lambert Dickson Group is 800-678-3246. Or, call Sholom Foundation at 952-939-1594. Sholom Foundation provides financial support for Sholom Community Alliance facilities, programs, and health and social services, primarily for older adults and within a Jewish environment.